In light of the recent stories Jia Qi and I wrote, we wanted to work on something more light-hearted. These stories/captions focus on our migrant brothers' everyday lives and deviate a little from the heavier topics we usually shed light on. 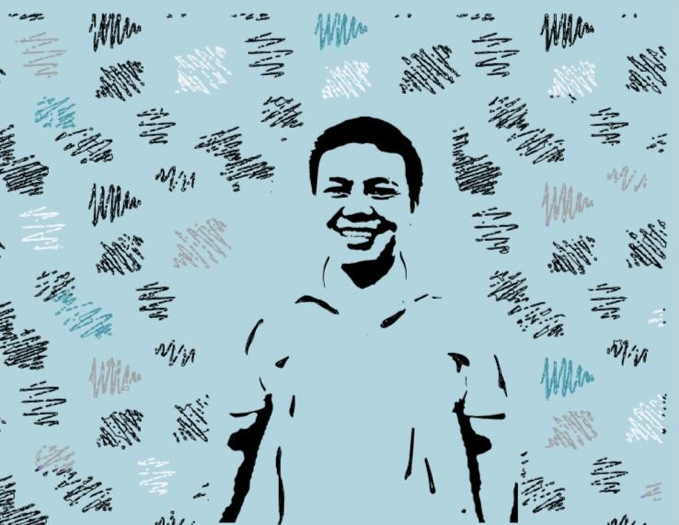 In line with our objective, we designed pictures of 5 migrant workers that draw some inspiration from pop-art to carry a quirky and light-hearted tone. We hope the short and simple sharings paired with the pictures will bring another dimension - one that is jovial - to our understanding of migrants’ lives, and we see them as more than only dull or sombre people. If you could learn something now, what would you like to learn? I want to learn how to produce blueprints for buildings. I did that from scratch to build my own home back in China, but it was an amateur one. I also want to learn more about healthy living so I can a live long, simple comfortable and happy life with my wife when I go back home. I used to be active in sports. I like playing basketball and I even ran for many sport events and it made me happy to win with my team. I also love it when the migrant brothers are together in a room, it makes things lively, like a family. I’m happy simply being around people. If there was one thing you can change about life back home, what would that be? Poverty is something prevalent where I live, especially when I was young. I wish there was something that can be done to bring these people better lives and not struggle to survive each day. What were you like as a kid? Did you have any aspirations? I was the most mischievous kid ever! (We can still see a little bit of that now!) I stopped studying in Primary 3 - it’s something I regret. I wasn’t a very forward-looking boy, so I didn’t really have an aspiration but I remember wanting to be a dad, to have a happy family. What were some odd or special encounters you had in Singapore? Odd encounters? My work injury. (The reason he came to HealthServe.) Isn’t it? How odd that I got injured after 20 years of being absolutely fine working here, haha. Jokes aside, I think it is interesting how there are so many religious institutions in Singapore! So many Churches and temples, and they even be found side by side. It’s amazing to me. What were your aspirations as a kid? When I was a kid, I wanted to open a departmental stall. You know, those that sell everything? I always imagined being the big boss there. What are some of your favourite foods? When I first came to Singapore, I didn’t think much of the food in here. But when I really tried it, wow. It’s really not bad! My favourite would be Wu Ji Popiah. Next up is noodle salad and curry chicken! Wow curry chicken is so good, especially when you dip the soft prata in the tasty curry. I really do enjoy Singaporean delicacies, laksa and all. We don’t really have food like this in China. Share something special about you with us. I was an aspiring entrepreneur in primary school. I went out selling red dates on a stick to people at the movies. My mum saw it and said, “You mean you can earn money with this?” Primary school me basically got the whole family on the bandwagon, slotting dates into sticks. Besides dates, I picked leaves (His equivalent of pandan leaves) whenever I saw them, and sold it to people. What about the drama series you like to watch on your phone?